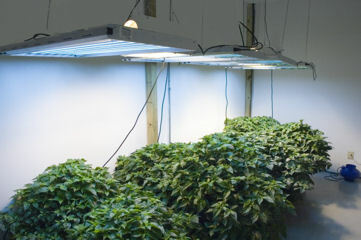 Brilliant new plant lighting - ideal for production of young plants and for general plant raising. LightWave is supplied with special T5 tubes that deliver the optimum colour balance for plant growth. T5s used in propagation will produce even healthy growth in most plant species. However, unlike other fluorescent lights they can be used throughout the growth cycle to produce mature plants of great quality. Reduced heat output allows closer positioning to plants in addition to operation in enclosed spaces without the heat build-up associated with HID systems. T5 Fluorescent tubes maintain lumen output longer and generally cost less than HID lamps. T5 fluorescent tube fixtures take up minimal space and can hang vertically or horizontally. Full-spectrum T5 fluorescents can stimulate both vegetative growth AND fruiting and flowering. However, the very best resuls can be achieved by switching to T5 Bloom tubes for the flowering/fruiting cycle. The most efficient, high-intensity low-heat horticultural lighting available is the LightWave T5 fluorescent fixture. The LightWave features a purpose designed wide dispersion reflector designed to cover a larger growing area than standard fluorescent fixtures. T5 Grow tubes (6500 Kelvin) deliver the bright blue/white light needed for exuberant growth. This light is perfect for the production of young plants and for all general plant production. These tubes are highly recommended for all plant applications and they have the added advantage of displaying showy plants - like African violets or orchids - to their very best advantage, emphasising the rich lustrous greens of the foliage and the bright colours of the flowers.